We’re giving you a sneak peak of what’s to come later this year. 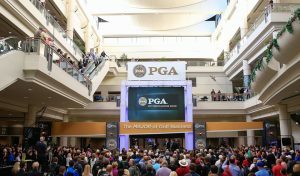 We have not long returned from the PGA Show in Orlando where we viewed the Fall 2014 collections and here exclusively on our Blog, we’re giving you a sneak peak of what’s to come later this year. For Fall, you should expect lots of bright colours for Menswear with sporty and travel inspired themes. 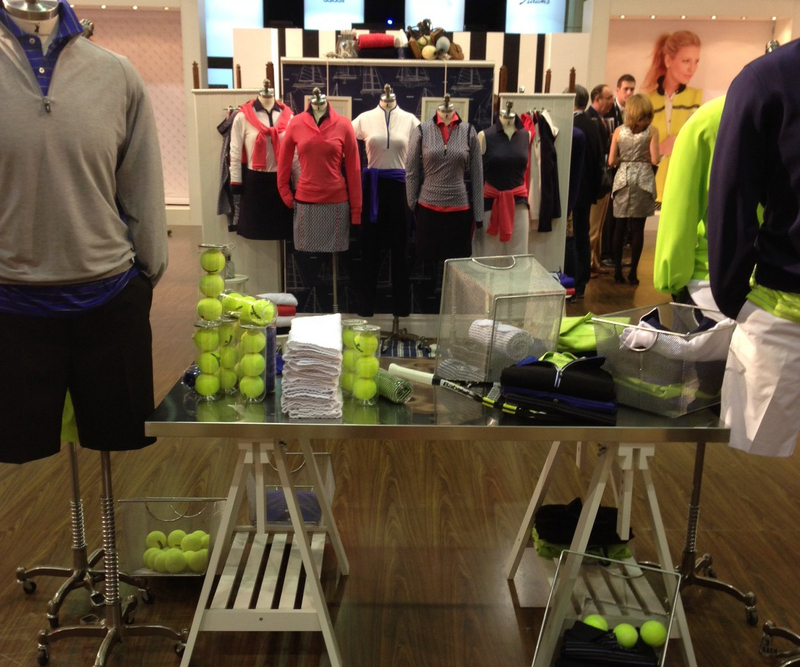 Fairway and Greene showcased their Centre Courts collection, which revolves around a Tennis theme, so expect Bright Blues and Tennis Ball Yellowy Greens. Positano is a collection based on the warm colours of the Amalfi Coast, Italy. Drawing inspiration from clear seas, beautifully painted buildings and seasonal fruits of the Italian cuisine, you’ll see an array of Blood Orange and Blue Sea colourings. 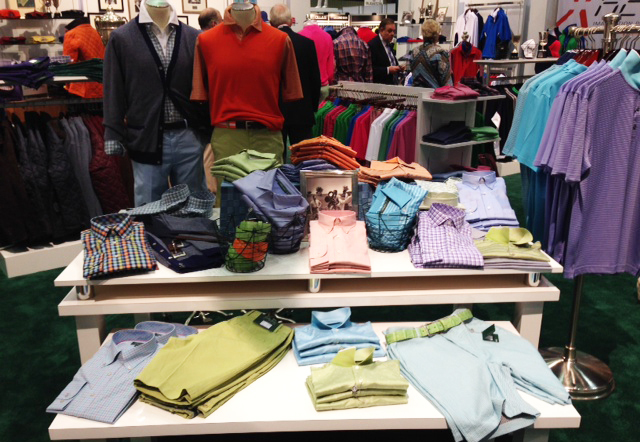 Bobby Jones’ Menswear is equally as colourful but opt for a more muted and pastel based collection. The Front Side collection (above) is made of the finest cotton materials and will feature three key colours – Wisteria, Apricot and Meadow. 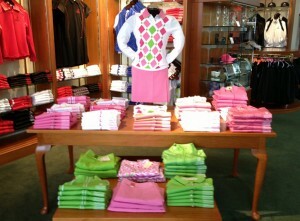 Peter Millar is one of our key sellers in our Golf Shops here at St Andrews Links, and had a vast array of cotton and technical pieces in bold colours. The colours that stood out most to us were Black and Pimlico Blue so we built a collection around these colours. We think that these colours will be a welcome addition to the Old Course Shop during the Fall season and will sit perfectly amongst the collections already in-store. 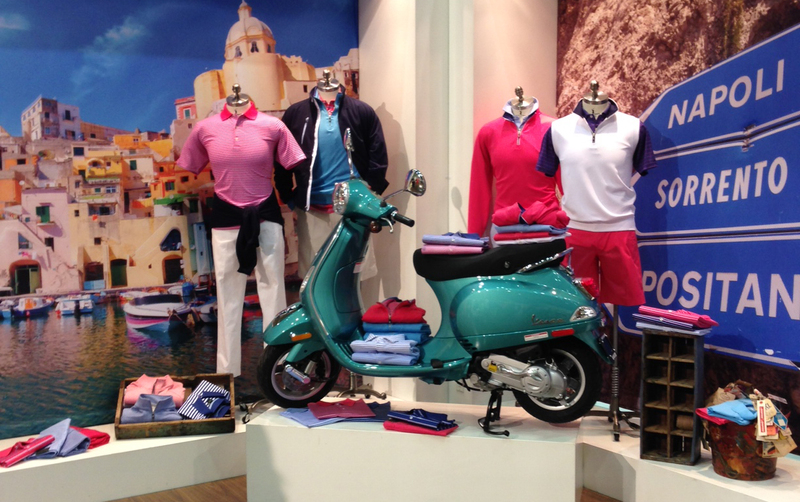 The Ladies collection from Peter Millar, something that we are selling for SS14 this year was available in colour stories revolving around Aqua or Orchid – two very different colour stories as you can see from the image below. It has yet to be decided whether we will have either of these stories available for Fall. 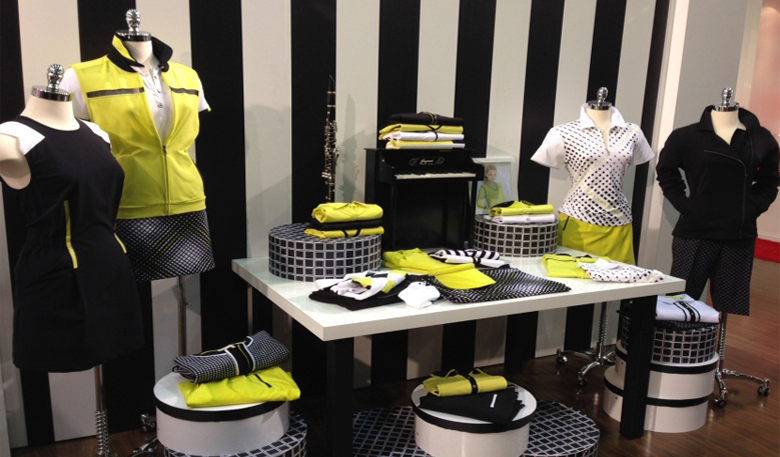 We also visited the Tom Morris stand during the PGA Show. 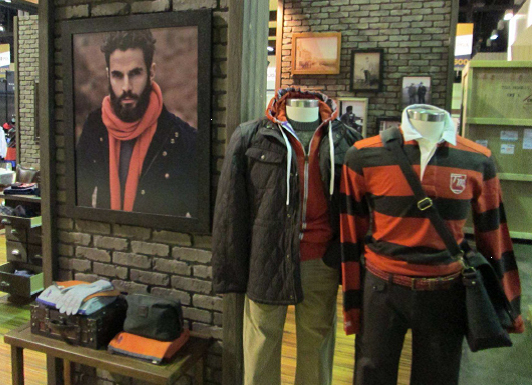 Tom Morris, which has its flagship store here in St Andrews, was exhibiting the Autumn-Winter collection for 2014. The collection is based on the famous road trip Old Tom made across Scotland, from East to West, to Prestwick. The collection draws on a tonal, autumnal palette of Russets, Vintage Blues and neutrals. 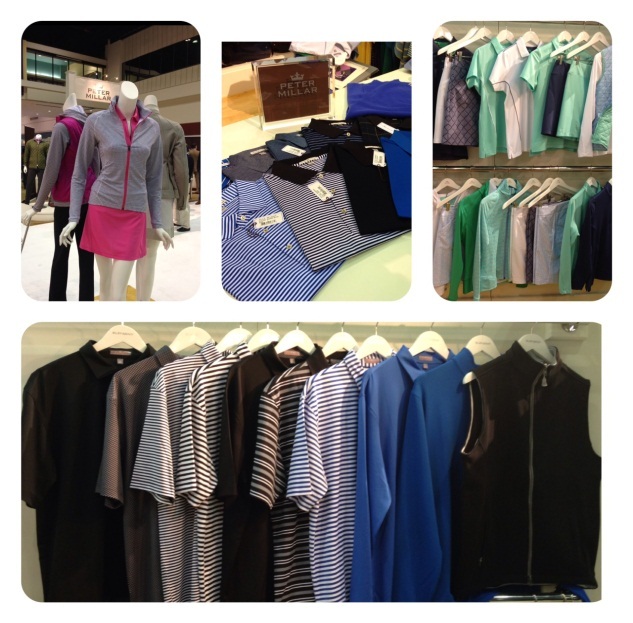 We hope our customers visiting the Tom Morris store or website this Fall will love the collection as much as we do! For our Men’s rain and wind wear, expect all of your favourite Rainwear pieces with a Fall update. The Power Torque Jacket and the Quarter Wedge (amongst others) will be available within a Red and Graphite Grey colour story. For the Ladies, the collections were fruity and sweet; monochrome with a splash of colour; deep; dark and nautical. 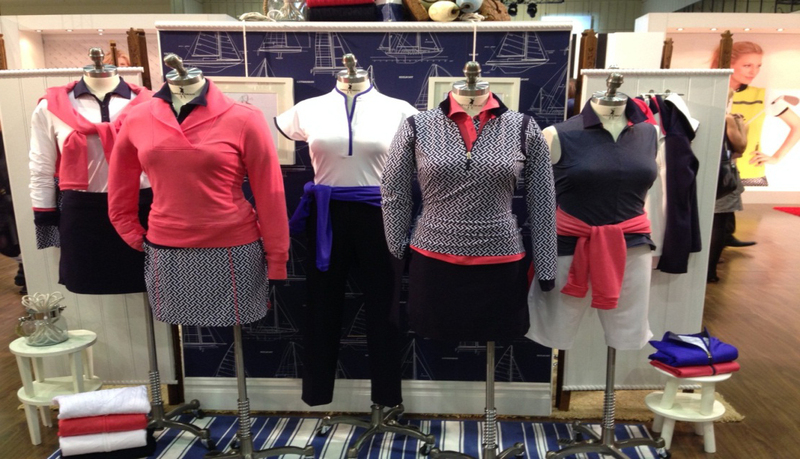 The ever popular nautical themed look came from Fairway and Greene. The Sail Away collection has an Americana colour palette of Yacht Blue and bright pomegranate Pink. The collection features a Chevron print and has a modern sporty edge. For EP Pro, both collections that are available for Fall are bold statements – one a sweetie based Red collection and the other a monochrome Domino collection with a pop of Yellow (Margarita). 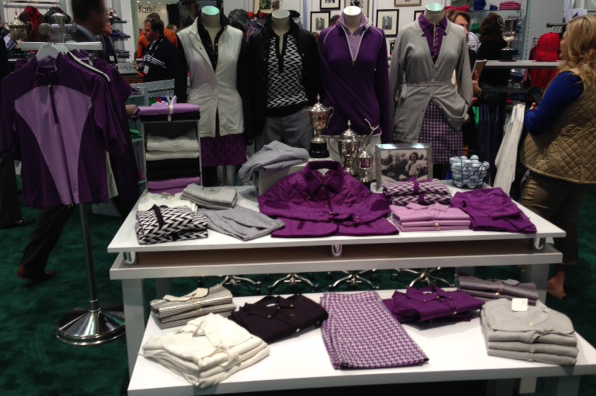 Purple was a popular colour at the PGA show, but the best Purple colour story by far was the Ladies’ Bobby Jones collection of Cassis and Black. A mostly technical collection with a few lifestyle pieces thrown in, the Cote D’Azur collection revolves around Purple and Black with hints of Grey. The Fall collections will hit stores during the month of July and we look forward to welcoming our visitors with these exciting collections later on in the year.